When you get to the Hannans North Tourist Mine in Kalgoorlie, it’s easy to accept it all at face value- mainly because at it’s face, its all amazingly daunting. From the sheer magnitude of your surroundings, to the historical atmosphere of the tourism mine, it’s easy to be blown away by everything you see. But we think there’s so much more to the place then just what is put in front of you, so we have got some little thoughts for you to ponder, to help you take in the vast energy of Hannan’s North, and the rich history that permeates the land and the people who reside here. #1 The Aboriginal people have a long history in Kalgoorlie, where a rock hole was a traditional water resource for the people of the area. The rock hole is an pivotal part of the Kulgooluh Dreaming. Aboriginal belief is structured around all life being part of one great network of relationships, which can be traced back to the spirit ancestors of the Dreamtime. They continue to interact with the sacred spirits of the Dreamtime, by “Dreaming”, where the era of creation is commemorated and celebrated through ceremonies, where ancient scenes are re-enacted, accompanied by chanting and didgeridoo, to relate ancient stories. 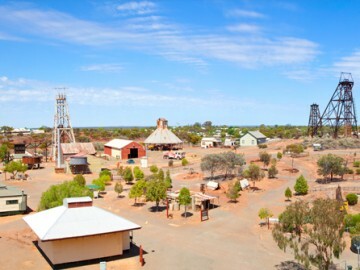 The place name “Kalgoorlie” is from Kulgooluh, the name of a local fruit. The main traditional custodians of the land are Gubrun, Maduwongga, and Kalamaia Kabu. #2 Within five years of the first gold claim being made, Kalgoorlie swelled to over two thousand people in five years- that’s at least one new person in town every day. Many of these were men seeking their fortune, but many were also the wives and children of these men, bundled up and moved across the country to live in ramshackle housing, in extremely harsh conditions. Child mortality rates were terrifyingly high, as diseases swept through the new town like wildfire, and many families suffered devastating losses as they waited for their turn to strike it big. #3 While many migrants came following the gold rush, it was especially difficult for the Chinese. The Chinese men were the most resilient member of their family, sent to try and create wealth to support his family which he has to leave behind, while his wife cares for his parents and his children. The Chinese culture heavily orientates itself around the family and ancestry, so to leave this community would have been heart-breaking for many. Upon arriving in Australia, the Chinese were specifically targeted and marginalised, as the competitiveness of the gold rush took grip of the social climate and minorities were attacked. Laws were passed deeming Chinese migrants to be ‘threats to society’, which resulted in wrongful arrests, commitment to lunatic asylums, forced vaccination, and eviction or refused entry to Australia. Hannans North has commemorating the struggle of the Chinese migrants with the development of the Chinese Gardens of Remembrance. #4 West Australia was a turbulent place, of high hopes and even higher stakes. If you close your eyes, you can still feel the land pulsing with the blood, sweat, victory and heartache which characterised the gold rush, and the soothing undercurrent of Aboriginal Dreamtime stories, still staking its ancient claim on the soil.